One unique and fascinating thing about currency is that it travels. Almost like a chain-letter, a bill can go from one person to another to another. A dollar bill you put into a machine to buy a candy bar in California may later be paid to someone cashing their payroll check at a bank in Las Vegas, Nevada. And like a well-traveled passport, sometimes cash, as it travels about, can get stamped with little designs known as “chop marks”. Some examples are shown to the right. Originally chop marks referred to marks made on coins circulating in Asia. These were made by merchant’s who would stamp the coins with a mark in order to indicate the authenticity and value of the coin. What do the modern chop marks mean? Who knows? It’s one of the interesting things about them. Banks in some countries may stamp bills that they have identified as “legitimate”. This may also be something like a stamp of approval or authenticity. Or perhaps the stamps are evidence of an elicit or shady transaction… If you come across an interesting one consider sharing it. 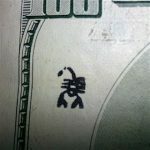 I should add, the most common “chop marks” are simply numbers written by hand across the face of a bill. These however are probably just written by a book keeper counting the day’s earnings into stacks and writing the stack total on the top bill. 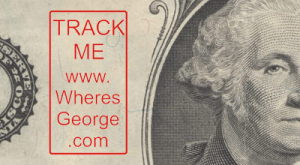 Similar to chop marks, there is a fun website called Where’s George (www.wheresgeorge.com) that allows you to track your own currency as it makes it way from stranger to stranger. It facilitates this by allowing you to enter into a database the serial number on your bills. You then write on your bill something like “Visit www.wheresgeorge.com to see where this bill has been” and then you spend the money. It’s that simple. Hopefully, as your money changes hands, someone will see the note you wrote and will go to the web site and enter the serial number. They will see where the money has been and you will be notified that it has re-surfaced. 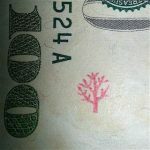 You can buy rubber stamps that make marking up your dollars much less labor intensive (search for “Where’s George rubber stamps” on-line.). From my own experience, only a small percentage of my bills ever re-surfaced — perhaps 10%. After year or so they stopped re-surfacing at all. It suggests to me that paper money is much shorter lived than we think. Still, a lot of fun when you get that hit on your line.